Every year New Directions Education celebrates World Book Day alongside their schools. This year, Senior Recruitment Consultant, Jennifer Morrison and Bookings Consultant, Mark Montieth went on a World Book Day tour of local primary schools around Wirral. They saw some fantastic costumes and the level of commitment for all schools was 100%. The schools welcomed Jen and mark to take some photos and each gave an outline of their day. The variety of activities and ideas was great. For World Book Day, the staff and pupils dressed up as characters from their favourite Roald Dahl character. Parents have also been asked to bring their favourite children’s book at 3.15pm to do a Mannequin Book Challenge. Jen and Mark got a great group photo of just some of the pupils’ fantastic costumes along with the head teacher Mr Brown. 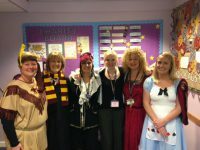 Pupils and staff all got involved in dressing up for World Book Day. The staff in the office had a Where’s Wally theme! Well Mark certainly found Wally! Great fun. They had an extra special guest for World BOOK Day, local child author Frank Cottrell-Boyce who was even on GMTV this morning and gave the school a shout out! Amazing. They also have the press coming into school this afternoon which they are looking forward to. They had a really good approach to World Book day. Instead of dressing up, they gave each pupil a parcel which contained a surprise book. On each parcel were words and clues as to what the book may be. The pupils that Jen and Mark sat with were really looking forward to revealing what it was as they have been busy guessing all day. The clues on the parcel we saw were Scrap, Empty, Broken hearted. One of the pupils Emily, thinks it may be a Julia Donaldson book and another pupil Archie believed the book had something to do with a bin.